Nothing produced is 100% good or 100% bad in regard to the environment or our health. We need to choose what we feel is the best balance. Conventional methods require less land usage for the same yield. This may seem unimportant, but given the decline in available farm acreage and the increase in population, land usage has become an important factor to consider. Organic farming does not use synthetic pesticides or herbicides. It is not fair to say that organic farms do not use chemicals. Most use natural pesticides and herbicides, but simply because it is natural does not make it safe. For instance there are plants that are poisonous if eaten and if you handle a cashew with your bare hands before it is processed you will severely burn your skin. There are actually 20 chemicals farms are allowed to use and still be called organic. A farm need only use one chemical not on the list of 20 to be tagged conventional rather than organic. Research has shown that some of these natural chemicals pose potential health risks too. Statistically there is more pesticide residue found on conventional produce than on organic produce on your grocer’s shelves. But, if you are buying your produce from a farm market it is a fact that many small conventional farms use less pesticide than organic farms. Often the pesticide is chosen because of its effectiveness. That means to achieve a certain result, less chemical pesticide can be used than its natural alternative. Many conventional farms limit the use of pesticides for both health and financial reasons. There are farms designated as conventional that don’t use any pesticides. There are many farming practices other than the use of pesticides that determine if a farm is labeled organic or conventional. 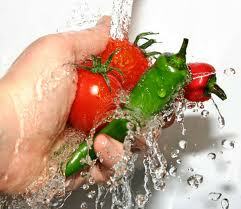 Pathogens such as E. coli and Salmonella are more likely from organic farms versus conventional farms. Though recorded levels are low in each, research has shown conventional farming methods to be as much as 20% less likely to allow these pathogens to exist than organic farming methods. The level of manure use in the two farming methods is suspected to be the reason for the difference. It is important to note that both organic and conventional farming methods do not exceed the safety thresholds set by the government. Produce raised from either farming method should be washed thoroughly before eating to remove any harmful residue or bacteria. This safety rule includes melons. Many people do not wash melons because they are only eating the fruit inside. However, the knife is cutting through whatever is on the outside of the melon and carrying that to the fruit inside. Unfortunately, melon is one crop that often has manure used as a fertilizer. Even if manure was not used as a fertilizer, it still lays on the ground in the dirt while it is ripening on the vine. So please wash melons before cutting into them just as you would for any other produce. Researchers have been studying the nutritional differences between organically grown and conventionally grown produce for over 50 years. This multitude of research has not verified a difference in nutritional value of produce based on organic versus conventional farming methods. Organically grown produce is generally smaller, blemished from insect bites, more costly and has a shorter shelf life than its conventionally grown counterpart. But facts show that organically grown is not necessarily safer or healthier. So instead of looking for the word “Organic”, the best way to determine possible health risks of the produce you are buying is to talk to the farmer that raised it about his farming practices.